I realized that I had to make an effort one way or the other when it came to Easter. I knew I could get away with not baking anything special but I also knew that Keith were expecting something nice and homemade to go in his Easter egg. Because I’m so interested in the making of chocolate and confectionery I couldn’t buy my way out like everyone else, it would be downright rude. I thought about it for a long time, and decided that I would feel bad if I didn’t put my whole heart in it, so I decided to 1. take a huge risk and make something I’ve never made before (apart from once when I failed miserably) because what I wanted to make would be the perfect thing to give and 2. take an even bigger risk and make my own recipe because I wanted it just right. Keith loves fudge and he loves rum and raisin. He also really like arrack so I decided to make some arrack and raisin fudge with chocolate melted in it because it goes so well with the arrack. If you don’t have any arrack, then just use rum or whatever boozy stuff you might have at home that you like. Baileys could be nice. 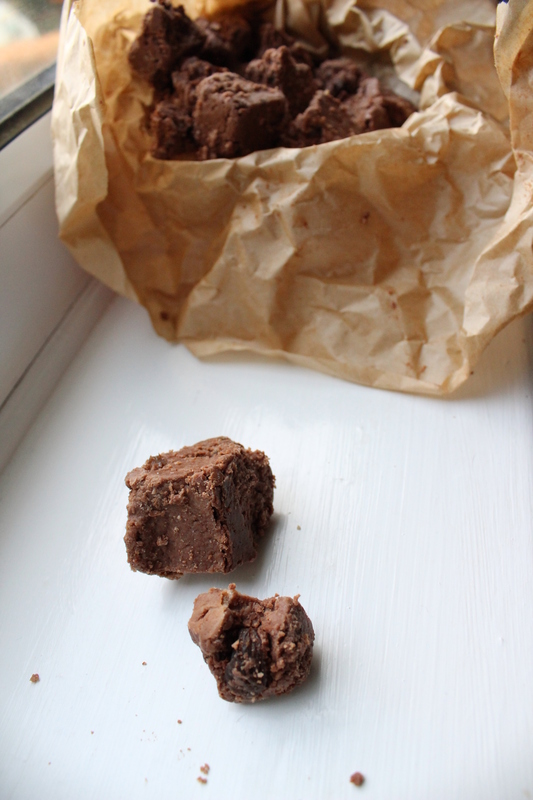 My only complains with this fudge is that it breaks when you cut it, but it’s very smooth and tastes great. You’ll need a huge saucepan. I used the biggest one in the house (a guess is that it holds five litres) and it still nearly boiled over. You’ll want to stir the mixture often (if not all the time) as it cooks to prevent any scorching. You’ll also need a thermometer and you’ll have to do a soft ball test as well just to make sure. Once it’s cooked to the temperature in the recipe you’ll need to let it sit undisturbed until the temperature is under 50 degrees C/122 degrees F (mine crystallized too fast so I had to start beating in the chocolate and the raisins when it was around 60 degrees C/140 degrees F. Since you’ll be using my recipe you might have to do the same), it’s really important not to poke at it too much because if it gets disturbed too much you might end up with a grainy fudge rather than a smooth one. To prevent the fudge going grainy you’ll also need to wash down the sides of the saucepan with a wet pastry brush in the start of the cooking process so that there’s no undissolved sugar crystals on the side that later one can seed it with big sugar crystals. And don’t weigh out the arrack, since it contains alcohol 60 ml wont equal 60 g.
Line a 20 x 20 cm tin with greaseproof paper and oil the paper slightly. Put the cream, sugar and arrack in a saucepan and bring it to the boil while stirring. Add the glucose syrup and stir until it reaches 118 degrees C/244 degrees F and when the mixture forms a soft, malleable ball when dunked in cold water. Take the saucepan off the stove and let it sit undisturbed for about 30-40 minutes until it’s between 50 and 60 degrees C/122-140 degrees F. Melt the chocolate and pour it over the fudge together with the raisins, mix it in and agitate the fudge until it’s very thick and matte. Transfer the fudge to the tin and pat it down with your hands. It will look greasy but it’ll sink in after a few hours when the fudge has set. Cut it carefully with a knife and wrap in paper and put in an airtight container. This entry was posted in Confectionary and tagged arrack, chocolate fudge, fudge, raisins, rum and raisin. Bookmark the permalink.